The coconut and lemon in this cake are good, but the sour cream is the real star here. It makes the cake super moist and, therefore, super delicious! Beat cake mix, 1 cup sour cream, eggs and oil in large bowl with mixer until blended. Pour into 10-cup tube pan or 12-cup fluted tube pan sprayed with cooking spray. Bake 40 min. or until toothpick inserted near center comes out clean. Cool in pan on wire rack 10 min. Run knife or metal spatula around edge of pan to loosen cake. Invert cake onto rack; gently remove pan. Cool cake completely. Mix remaining sour cream, coconut and sugar in large bowl until blended. Gently stir in COOL WHIP. Use to frost cake. 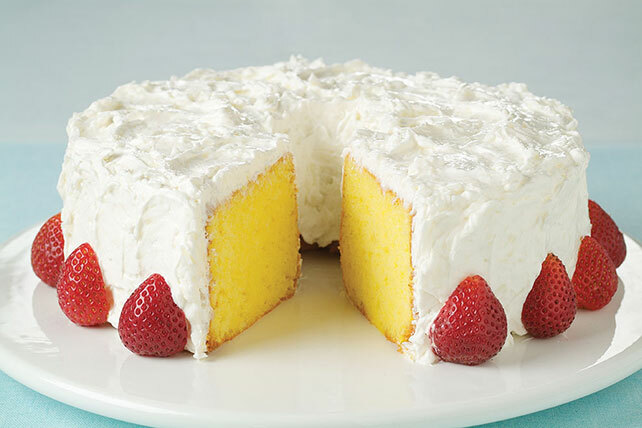 At 16 servings, this delicious cake makes a great dessert to serve a crowd on a special occasion. Garnish with halved fresh strawberries just before serving.